How to enable and configure IP masquerading, also known as Network Address Translation, for Linux. How to easily add to or modify the existing subsystems of Red Hat distributions of Linux. A look at several of the more flexible filters, programs that read some input, perform some operation on it, and write the altered data as output. 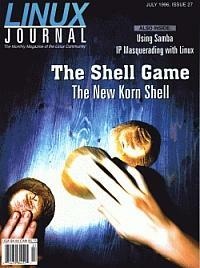 ksh93, the latest major revision of the Korn Shell language, provides an alternative to Tcl and Perl. Linux makes a great server for any computer network.